Click the button below to add the Generac 7035 16kW Guardian Generator with Wi-Fi to your wish list. NEW 2018 WI-FI MODEL (SAME AS MODEL 70351). The Generac 7035 is run by The Generac G-Force Engine. This engine is pressure lubricated, stable and reliable, able to handle rigorous use, and needs less regular maintenance than most models. The Quiet-TestTM Self-Test Mode runs the generator at a lower RPM while it performs a five or twelve-minute test. It is also a more fuel-efficient model. The 7035 is Wi-Fi capable. The True Power TM Technology in this model means reduced harmonic distortion by less than 5%. This equals smoother quality of power for sensitive devices and appliances. This model has an Aluminum Enclosure and a RhinoCoat powder-coated finish. These features defend against corrosion, and make this model durable and able to survive the elements, including 150 mph winds. 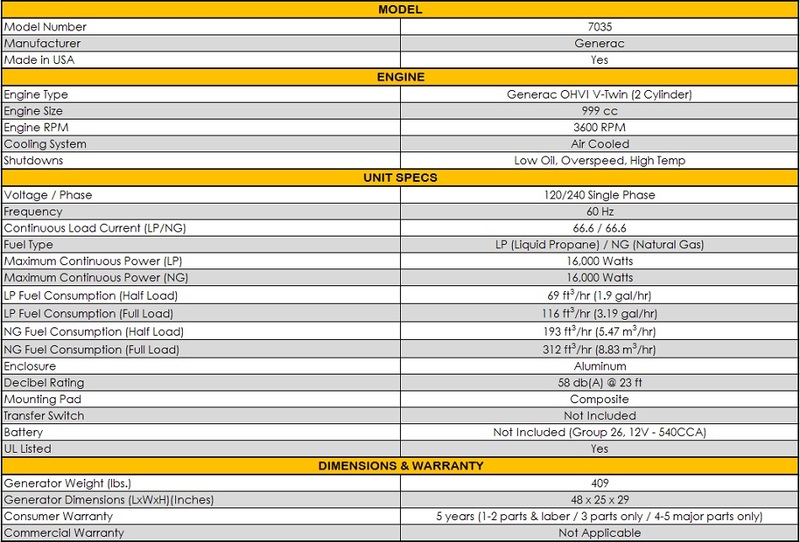 The Generac 7035 comes with a 5-Year Limited Warranty. *This model does not include an Automatic Transfer Switch. The Generac 7035 16/16kW Air-Cooled Standby Generator offers enough electricity for your home and protection of your house’s circuits. It’s a quiet generator model with clean and gentle power for your delicate appliances. The 7035 is powerful enough to run the entire home if connected to a Generac Load-Shedding Switch, and can even power a 5-ton AC unit. The powerful Generac G-Force Engine runs the 7035. This engine is stable, can survive constant use, is pressure lubricated, and does not require as much systematic maintenance as other units. It delivers up to 16000 LP watts and 16000 NG watts of electricity. The 7035 weighs approximately 419 pounds and is 48” long, 25” wide, and 29” high. This model does not include an Automatic Transfer Switch, but provides significant backup power to a house. It is quiet enough for residential areas, operating at 66 Decibels. This particular unit possesses a Quiet-TestTM Self-Test Mode; this reduces the generator’s RPM, and then the unit self-tests for five or twelve minutes. Features like this help make this model more fuel-efficient, too. It has enough power to run both the home and its appliances. Also, Generac 7035 16/16kW Air-Cooled Standby Generator supplies electricity clean enough for sensitive appliances. True PowerTM Technology decreases harmonic distortion—at less than 5% distortion, the power is cleaner and safer for devices. The Generac 7035 has technological features that make it more modern and efficient than many other generators. The Mobile LinkTM Remote Monitor (sold separately) is a device that allows a homeowner to monitor the generator, even from far away. All a person needs is a smart device, such as a smartphone, tablet, or computer, and internet access. With these, you can access information on the generator’s operations, service schedules, and more. Generac’s Evolution™ Controller on the unit also reveals the unit’s battery use and maintenance requirements, all in multiple languages. The 7035 also has protective features so that the generator can withstand the weather and other potentially damaging forces. An Aluminum Enclosure and RhinoCoat powder-coated finish defend against corrosion, and other wear and tear. When a storm hits, the Generac 7035 can withstand up to 150 mph winds. These and all Generac generators are constructed in the USA with domestic and foreign parts. Generac takes product reliability seriously, as well as customer support. They provide 24/7 customer service all year long. This particular unit comes with a 5-Year Limited Warranty and Generac is always ready to provide assistance. I like the new design where the side of the unit is removable. With a couple screws removed you can get at all you wiring and put the battery in without any fuss. I install many different brands of generators, Generac is a high quality product. Our 16kw Generac generator is fantastic. Powers up everything that we need. first test was yesterday when we experienced a 2 hour outage. Came right on and performed great. Great generator. was impressed with the technical support we received from AP Electric. Our electrician had one small question during installation and he called AP Electric and they were able to answer his question immediately. Very pleased that I made the decision to purchase a Generac 7035 16kW generator. It had been installed for about three weeks and the we had a brief power outage (about 4 hours). Performed perfectly. Just the reason why I invested in back-up power. Super Happy! Great generator and quick shipping on Generac Generator purchase. Thanks, for the quick delivery on purchase of Generac's 7035 16kW Guardian Generator. It has not been installed yet but the electrician is arriving tomorrow. I would recommend any who is ordering this generator to order the battery with it. Came neatly packaged on top of the generator. One less hassle on having to go out and buy the right generator.